25th anniversary Silverstone Classic celebrates Chevron’s Golden anniversary! This month’s very special 25th anniversary Silverstone Classic (24-26 July) will be celebrating many notable motoring milestones both on and off the famous Grand Prix circuit. One of the spectacular highlights on Silver Sunday will be a massively oversubscribed grid for the Guards Trophy race which, appropriately, will feature one of the biggest gatherings of much-loved Chevrons seen for some time. Chevron was founded by Derek Bennett exactly 50 years ago in 1965 and produced a number of outstanding sports racers as well as enjoying considerable success in Formula 2, Formula 3 and Formula 5000 single-seater categories. Unusually the company was situated well away from the rest of the British racing car industry, which tended to be located in an arc between Northampton and Woking. Bennett was a proud Lancastrian and famously chose to base his business in an old mill in Bolton. Raced by several of the era’s most distinguished drivers such as Peter Gethin and Brian Redman, Chevrons scored many significant wins both at home and abroad before Bennett, tragically, was killed in a hang-gliding accident in 1978. His timeless cars, though, live on today and remain extremely popular and successful in many of the world’s foremost historic racing classes. The celebrated B6 and B8 GTs from the late sixties are arguably the marque’s most iconic models and – in a fitting tribute to the company’s 50th anniversary – no fewer than 10 of these very desirable 2-litre machines will be among the front-runners in Sunday’s special Guards Trophy race at the Classic. Adding to the sense of drama, they will all be competing in a packed 40-minute showdown with a mandatory pit-stop and optional driver change. Even with 58 places for these evocative pre-1966 GT and pre-1969 sports racing cars on the starting grid, demand has far outstripped supply. An incredible 90 entries were received; these have been whittled down to 58 starters and 12 reserves. While the B6s and B8s are the likely pacesetters – notably the B8 shared by Martin O’Connell and Andrew Kirkaldy – they are sure to face stiff competition from Graeme and James Dodd in their Ginetta G16, the swift Lenham of Stuart and George Tizzard and the Elva Mk75 of Max Bartell and Callum Grant. Michael and Andrew Hibberd are also podium contenders in their Lotus 23B. Away from the sports racing cars, a tremendous field of pre ’66 GT cars will provide a race within a race. The mighty 4.7-litre TVR Griffith is a likely leader in the hands of Mike Gardiner and Dan Cox. There are five more Griffiths in the pack, too, plus the very rapid AC Cobra of Robert Bremner and the leading Jaguar E-types with renowned aces Sam Hancock, Nigel Greensall and John Cleland at their helms. Among the less powerful GT cars, notable contenders include the Lotus Elan of Paul Tooms, who is paired with former British GT champion Michael Caine, and a gaggle of Marcoses, MGBs and TVR Granturas. 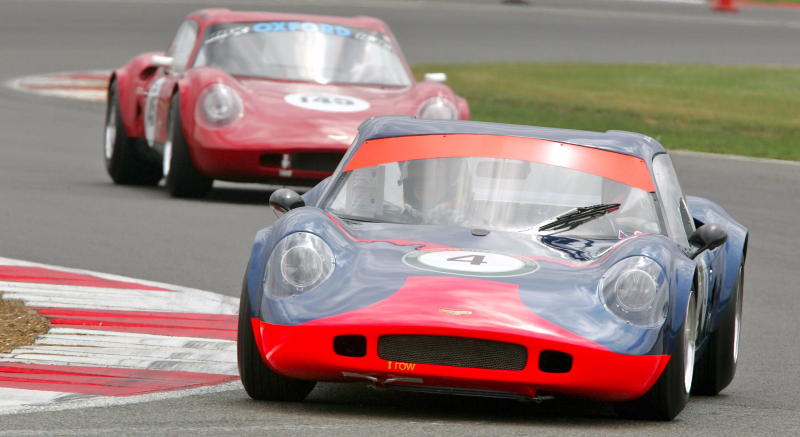 Blessed with such a bumper grid, the Guards Trophy is set to take its place among the many showstoppers at this year’s record-breaking Silverstone Classic. All that’s now needed is a stirring Chevron victory to put the icing on the 50th birthday cake. In total, Sunday’s packed programme features 11 mouth-watering races and high-speed demos including the prestigious Royal Automobile Club Tourist Trophy for Historic Cars, Masters Historic F1, Group C prototypes and Super Tourers. The unmissable action starts at 9:00 and doesn’t cease until 18:00.